Handcrafted to reflect the stylish sensibilities of the modern gentleman, Aspinal of London's Cufflink Box features eight suede-lined compartments to store your favourite cufflinks while safeguarding them against scrapes and scratches. 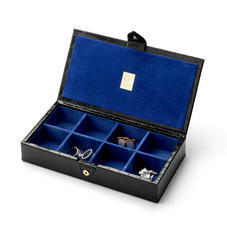 Suitably luxurious yet stylishly understated, each box is bound in superior quality Italian calf leather. Choose from a selection of rich Amazon brown and classically refined black to complement your personal taste and add initials for a truly personal touch. The Aspinal Cufflink Box is a miniature work of art with eight compartments to safely store eight pairs of your favourite cufflinks. Handmade from the finest Black mock croc Italian calf leather and lined in Aspinal's signature contrasting soft-suede, our cufflink box has the same delightfully luxurious feel as the grander Aspinal dressing cases. 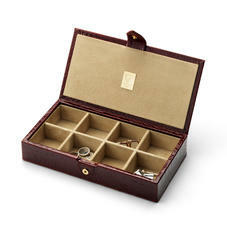 The case opens and closes with a secure leather tab fastener and can be personalised with initials.